I was inspired to create this deck as a divination tool to empower you to connect to the you within. I purposefully have chosen not to include detailed instructions with this deck of cards as I encourage you to explore and use them as you are guided to do so. You can simply choose to ask the question, “What do I need to know for today?” and then pull a card or as many that you feel led to pull. Love is a feeling, an emotion, a state of being. When you focus on loving yourself, it is empowering. Doing so isn’t selfish; it is self-love. You are worthy to receive the same love that you give out. Don’t doubt your ability to love and to be loved. Practicing self-love is a choice. It is not the result of achieving this or attaining that. There is nothing to wait for or anyone to wait on. Self-love is not a destination; it’s a journey. In his book, Whatever Arises, Love That, Matt Kahn refers to “the new paradigm of spirituality as a love revolution that begins with you,” which reminds us that self-love is essential as the basic foundation on which we build a happy and abundant life. What is the Difference between Victimhood and Empowerment? According to Matt, “In victimhood, you hold yourself emotionally hostage while waiting for others to tell you what they may not be able to say. Until they do, you remain at odds with life, blaming those who haven’t spoken the words you need to hear as the reason for your suffering. Now is the time to love you for who you are through the empowering act of self-love. It is time to love the choices you make. Feel empowered and give yourself permission to connect with and embrace the power of your heart as you focus on your physical health and mental/emotional well-being. This is a gentle reminder to do your best to focus on your own journey into consciousness rather than feeling that you have to keep up with the proverbial Jones, whether it be your friends, family members or even co-workers or colleagues. At times, you may feel like a kid in a metaphysical candy store with a plethora of options to choose from – classes to take, books to read, modalities to study, and so on. Choose to really feel into what resonates with you personally instead of what your friend or colleague is doing. When you consciously choose to step into your power and tune in to what is right for you, the answer will be very clear. You will know what feels right and what doesn’t. You will know if the class, teacher, book, or modality resonates with you personally. The feeling of empowerment is a strong knowingness and undeniable. When others attempt to guide you based on their own preferences, the feeling is one of uncertainty or confusion. It may be right for them, but it may not be right for you. In the same sense, share your experiences and opportunities with others, but do your best not to influence them or make them feel obligated. Let them make up their own mind. When you do, both of you are empowered! Each one of us is a spiritual being having a human life experience incarnated into a physical body for this incarnation. Recognizing that you are a spark of the Divine and that you are a beautiful, unique and miraculous creation, it is essential that you love you for who you are. Doing so isn’t self-ish; it is self-love. When you open your heart to loving you, you allow the love you have inside of you to expand outwards to attract this same love back into your life. How do you view yourself? What does your self-talk sound like? Is it negative/critical or positive/life-affirming? Take a moment to tune in and write down any self-perceived imperfections or negative thoughts that come into your awareness. Then, allow yourself to read what you have written. How does it feel when you read what you have written? Now, let us shift the energy and move into the vibration of loving you. Take a moment to tune in and write down positive thoughts about yourself as well as compliments you have received from others that come into your awareness. Then, allow yourself to read what you have written. How do you feel when reading these words? Allow yourself the opportunity to become mindful of the energy you are putting out into the Universe with your thoughts, words and actions as you are attracting this same energy back into your life. Your self-talk and the other thoughts running through your mind are similar to radio signals or energetic emissions. Word modification may be necessary as you practice being cognizant of your thoughts, words and actions. Can you say the same thing in another, more positive, life-affirming way? Consciously choose to be your own kind of beautiful and embrace the you that is you! Yes, this means all of you, including any perceived imperfections you may have as well. Recognize that there is no one else in the Universe exactly like you. Make the choice to love yourself for who you are – fully and completely. Accept your uniqueness and dismiss any perceived flaws or imperfections because you are perfect just the way you are. As each one of us becomes more aware of our energetic emission as well as the importance of shining our Light bright, we offer others the comfort-ability to do so for themselves as well. As we change ourselves (and our thought processes), we change the world. Intuitive Medium, Reiki Master and Spiritual Growth Coach Shelly Wilson would love to assist you on your spiritual journey. 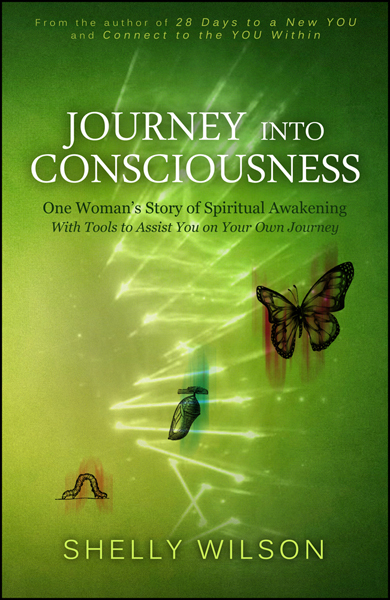 She is the author of 28 Days to a New YOU, Connect to the YOU Within and Journey into Consciousness. In addition, Shelly is a featured columnist and an Executive Editor for OMTimes Magazine. 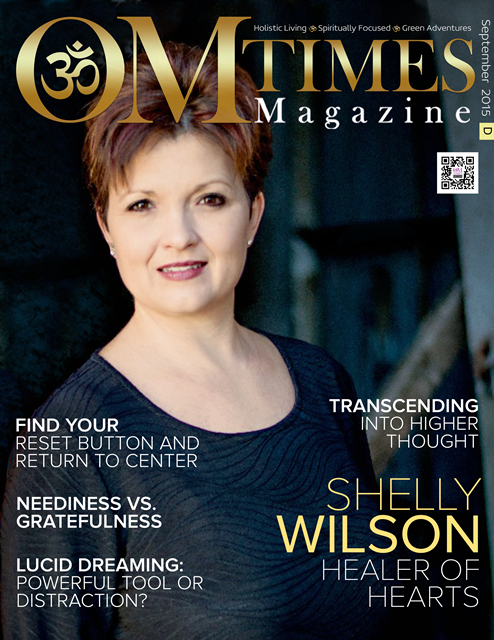 OMTimes is excited to have Shelly Wilson gracing the cover this week. OMTimes Magazine Executive Editor Shelly Wilson is an Intuitive Medium, Reiki Master and Spiritual Growth Coach. A popular author, radio host and speaker, her books include 28 Days to a New YOU, Connect to the YOU Within and Journey into Consciousness. OMTimes is proud to share this exclusive interview. Her interview is on pages 20-29 of the multimedia edition. Her article, Consciously Create the Life You Desire, is on pages 70-74. The direct link to her interview can be found on the OM Times website. I remember singing these beautiful words in Sunday school when I was a child. As I am sitting here reflecting, I don’t believe that I really knew at the time the poignant meaning behind these simple words. I remember that I definitely didn’t feel like I was shining my light bright. I just happened to be singing the song. As I have mentioned before, I was conditioned as a child to mind my manners, keep my opinions to myself, and do as I was told. I lacked both confidence and self-esteem, and I was painfully shy. My light definitely was not shining very bright, and I am not sure that it was even shining at all. Fast forward many years, I read Marianne Williamson’s powerful quote, “A Deepest Fear,” and discovered the significance of shining my light bright. Marianne’s words had an enormous impact on my life the first time I read them. Actually, every time I read this quote, I have that same feeling of empowerment wash over me. It is the perfect reminder for me to shine my own light bright, and I encourage you to do the same. Are you capable of doing this? Is it possible for you to shine your light bright? Don’t hold back now. This is your life, you are creating it, and you have the power to choose how bright you want to shine. You are in control of your light. No one else is nor should they have the ability to control it. Do not allow anyone to dim your light under any circumstances for any reason whatsoever. The important thing is to recognize that this will happen and then acknowledge when it happens so we can move through these feelings rather than allowing them to manifest further. As I honor my own light, I also honor everyone else’s light. I honor and respect the emotions that I feel so that I can continue to grow physically, mentally, emotionally, and spiritually. I understand that I need to honor the light within me so that it can continue to shine bright. With that said, I am paying attention to the guidance that I am receiving. I know and trust that all is happening exactly as it should in this moment and in every moment. What I have come to realize is that life is truly all about making choices and then choosing to take action on the choices that we make. When we align our thoughts, words, and actions with our beliefs and come from a place of love, amazing things will and do happen. We attract those people into our life who are a reflection of us. To connect with our inner light, we must connect with our heart and open our heart to love. Intuitive Medium, Reiki Master and Spiritual Teacher Shelly Wilson would love to assist you on your spiritual journey. With respect, truth, integrity and love, Shelly honors your free will and recognizes that you are co-creating your reality with the Universe. She offers private readings, intuitive coaching, Reiki sessions, and teaches workshops. Shelly’s books, 28 Days to a New YOU, Connect to the YOU Within and Journey into Consciousness, are available in paperback and eBook.